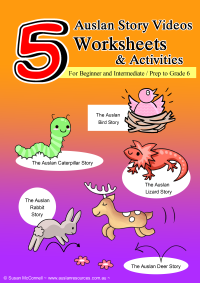 Try it out before purchasing - the first story of the 5 Auslan Story Videos, "The Auslan Bird Story", is provided for free, which includes video, worksheet and a flash game. How to implement this in your class? The video is downloadable and includes five short Auslan stories, about 2 to 4 minute each, signed by a native Auslan signer from the Victorian state. Each Auslan story has fun and expressive pictures within the story so that students are able to follow the Auslan story without getting overwhelmed or lost. It is a great Auslan video series for beginners. All Auslan stories include Auslan linguistic elements, such as tokens, surrogates, role shifting, facial expressions, eye gazing classifiers, and proforms, just to name a few. With the additional Introductory to Auslan Linguistic Elements Video (not included in this package, but highly recommended), teachers can go a step further and introduce these linguistic elements to further challenge students who are already knowledgeable about Auslan. The 5 flash games are downloadable, each flash game includes mixed-up picture storyboard of the Auslan story where the students try to re-arrange the pictures into a correct sequence according to the Auslan story video. Teachers can use this game with the class after the class have watched the Auslan video together. This flash game can be played on a smart board and is a fun way to help develop student's Auslan skills with the whole class' contribution and feedback. The e-book includes worksheets activities where after the students have seen the video and played the flash games, they can then work independently on arranging the stories into correct sequence. Some students work better independently and it will help them to internalise what they have learnt. Teachers' answers sheets are also included in the e-book. Also included are some activity ideas which teachers can use after watching the Auslan stories. This e-book has an extra bonus: a handshapes chart with labels for all different kinds of handshapes and handshapes cards. Teachers can print out these handshapes cards for group activities to help the students recognise different kinds of handshapes being used in the Auslan stories. If you would like to try it out before purchasing, and to see if it works in your computer, the first Auslan story, "The Auslan Bird Story", is provided for free, which includes the video, flash game and worksheet. The signs in the 5 Auslan Stories are from the Victorian state, signs all around Australia are generally the same except for a few, especially colours. If you are from a state other than Victoria, please double check the signs that they are the same that your state use. Once payment has been made, an email will be sent to you in 1 to 3 business days with a Drop Box link where you can download the e-book, video and flash games. Click here for instructions on how to play the flash game after you've received it. The 5 Auslan Stories e-book, video and flash games are copyright and for personal and school classroom use only. The e-book is to be printed only once its entirety per individual/teacher and the individual/teacher may photocopy the e-book as many times for personal and classroom use. Please do not photocopy, reprint or distribute the e-book/video/flash games to other individuals or teachers, please direct them to this website to purchase them instead. For Individual Auslan Teachers and/or Companies - if you would like to use e-books, videos and flash games from Auslan Resources as part of your Auslan teaching business, for example, teaching private Auslan classes or community Auslan classes, please contact me for permission and special deal discounts.